In the sixth year of its ongoing mission, the Strange New Worlds writing competition has once again sought out exciting new voices and imaginations among Star Trek's vast galaxy of fans. After scanning countless submissions for signs of style and originality, the judges are proud to report that the universe of amazing Star Trek writers just keeps expanding. 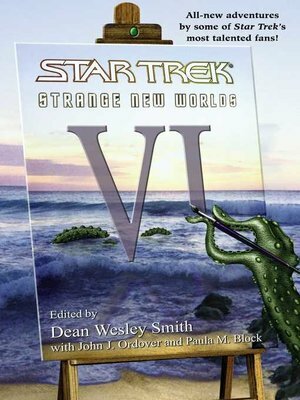 Strange New Worlds VI features twenty-three never-before-published stories spanning the twenty-second to the twenty-fourth centuries, from the early days of Captain Jonathan Archer to James T. Kirk and his crew to the later generations of Captains Picard, Sisko, and Janeway. These memorable new tales explore and examine the past and future of Star Trek from many different perspectives. This year's contributors include such diverse life-forms as Julie Hyzy, Shane Zeranski, Penny A. Proctor, TG Theodore, Mark Allen, Charity Zegers, Juanita Nolte, G. Wood, Pat Detmer, Robert J. Mendenhall, Geoffrey Thorne, Russ Crossley, Louisa M. Swann, Scott W. Carter, Shawn Michael Scott, Brett Hudgins, Robert J. LaBaff, Paul J. Kaplan, Jan Stevens, Kevin Andrew Hosey, Elizabeth A. Dunham, Mary Scott-Wiecek, Robert T. Jeschonek, and Annie Reed. Join Strange New Worlds in its thrilling quest to uncover the most compelling Star Trek fiction this side of the Galactic Barrier!